Pick one up today at the Owen Sound Long & McQuade store or the Georgian Bay Symphony office. Programs will also be available at every venue. $10/each. Free admission to all venues and events with program. To view the complete festival, visit our Festival at a Glance page. Admission: $2.00 admission to all venues /$5.00 admission to Festival of Stars, or free with programme. Download our Complete Syllabus: To help you choose your classes, you can now download our complete syllabus. To download only portions of our Syllabus, simply visit our Download Syllabus page. Student Registration Forms: To help your students choose their classes, you can now download a Student Registration Form. The form includes instructions on how to register online. Please note: All registrations must be completed online. Piano Set Pieces for 2019: Download the Set Piece List for Piano 2019. Special thanks to the Owen Sound branch of Ontario Registered Teachers Association (ORMTA) for creating this list! 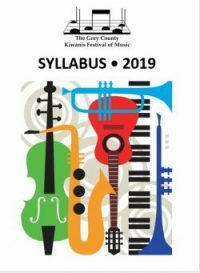 The Grey County Kiwanis Festival of Music adjudicators will be providing recommendation letters for students wishing to apply. Visit Sweetwater’s website for more information. Bayshore Broadcasting and MIX 106.5 are the Festival of Music's 2019 Media Sponsor! Listen to our new commercials on MIX 106.5. A big thank you to the creative team at MIX 106.5! Thanks also to the Allegro Youth Chorus and Notre Dame Concert Band. Their music was featured in the commercial. Thanks to our past-Chair, John McLachlan, we've obtained a generous grant from the Community Foundation Grey Bruce that allowed us to create this new website. Thank you Community Foundation Grey Bruce for the generous grant! Thanks also to Doc Pc Web Creations for taking on this project! Congratulations to everyone on another successful festival! We were extremely impressed by the level of talent in this area!! For a complete list of the 2018 Festival of Music winners and provincial nominees, please visit our Awards page. We're proud to have the Kiwanis Clubs of Owen Sound and Meaford as our major sponsors! Kiwanis is dedicated to improving the world one child and one community at a time. Through our music festival, Kiwanis is doing just that.